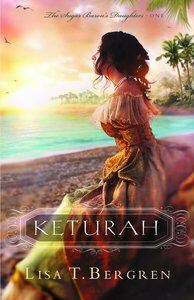 Set on keeping her family together and saving her father's plantation, can Keturah ever surrender her stubbornness and guarded heart to God and find the healing and love awaiting her? About "Keturah (#01 in Sugar Baron's Daughters Series)"
Customer Reviews For "Keturah (#01 in Sugar Baron's Daughters Series)"
I enjoy Lisa T Bergren's novels and this was an interesting one, if a bit unlikely. Three sisters set off for the danger-filled Caribbean to bring their father's plantation back from the brink of failure. I enjoyed a lot of the setting of the story, particularly the trip from England and all the difficulties of travel at that time. It was also interesting to see how Bergren handled the subject of slavery and the status of women in that society. I did struggle, however, with the girls being allowed to go on this adventure at all - particularly unchaperoned - and that they would even think to wear pants in that era, much less be accepted by even the people they were helping if they did. But the plot line kept me reading despite those issues. It's clear from reading this first in the series that she plans to follow the other two sisters' stories in each of the subsequent novels.